through a visual feast of poetic motion. When you think of tropical islands, those little surf paradises, what do you think of? Hawaii, Fiji, Indo… the Maldives maybe. But do you think of Australia? Matt Kleiner’s documentary “Way of the Ocean” will make you. Kleiner sets out to make surfing synonymous with Australia, the world’s largest island, in his film debuting at the Santa Barbara International Film Festival Saturday 29th of January at the Santa Barbara Museum of Art. “Way of The Ocean” is a nature driven, poetic epic about the relationship between Australia and surfers through the ages. Since surfing was introduced to the island in the early 1900s, it has become a way of life and more for the people of the water-locked continent. From the Barrier Reef to the cold Southern Ocean, Australia provides some of the best surfing in the world within its 20 thousand miles of coastline. It is also a coastline that has – for the most part – been preserved and well-kept, an important message the film hopes to convey. “Even throughout frequent use and some over-crowding in certain places, it is clear that they look after the beaches and maintain this pristine environment. Living in Southern California makes it easy to see that we need to start taking serious steps towards cleaner water and beaches,” Kleiner said. Kleiner, a Santa Barbara native, said the production process was a tedious one. people to appreciate the ocean and do what they can to help preserve it in our area of the world. The film is by no means short on high-performance surfing footage either, as it features Asher Pacey, Josh Kerr, Taj Burrow, Adam Robertson, Jordy Smith, Dane Reynolds, Craig Anderson and Kelly Slater. Using a combination of 16 mm and high definition cameras, Kleiner tackles water and land alike to create a visually stunning film about the nature of surfing and man’s relationship to the water. Kleiner believes this movie will appeal to surf fans and non-surf fans alike. Between the breath-taking scenery, the smooth blend of image and sound, and the spirit of surfing, there’s something for everyone in this film. “Way of the Ocean” is part one of a five part film series that intends to span across the globe’s oceans and surf. The second installment in the series will be covering North America, which has started production this month. Oceanography in China : who rules the waves ? Imperialism and oceanography often go hand in hand. The British Admiralty’s surveys of the world’s coastlines and shallow seas during the 18th and 19th centuries brought a wealth of scientific knowledge. They also did no harm to the ability of British merchantmen to navigate the world—and of British warships to dominate it. Viewed from that perspective, China’s southern neighbours might be slightly nervous about a meeting held in Shanghai on January 26th and 27th, which gathered the country’s oceanographers (including several who work abroad) to discuss a project called South China Sea-Deep. As its name suggests, this project is intended to explore the South China Sea, a patch of water with an area of 3.5m square kilometres and a maximum depth of 5.5km that China’s government regards (despite competing claims from every other country with littoral waters there) in much the same way that ancient Romans regarded the Mediterranean: mare nostrum. The scientists in question disclaim any intent to push back frontiers other than those of human understanding. They also say the project’s focus is on basic scientific matters rather than a search for things like oil and mineral resources. No doubt that is true—just as it is true that many who sailed under the Admiralty’s aegis were motivated by a thirst for pure knowledge. But knowledge is power, and if Chinese scientists are the first to explore the depths of the South China Sea, then Chinese businessmen will be better placed than others to exploit any commercially valuable finding that they make, and the Chinese navy will be better placed to defend them. South China Sea-Deep is led by Wang Pinxian, of Tongji University in Shanghai, a doyen of the field. To assist him, he will be able to call on the services of Jiaolong, China’s latest deep-submersible vehicle (pictured, planting a flag), which is designed to dive to a depth of 7km. Last July Jiaolong managed 3.8km. The craft’s handlers aim to push that to 5km this summer and to the full amount next year. The project is partly inspired by a study carried out aboard a vessel called Dayang Yihao in 2007, of the then little-known Southwest Indian Ridge. This is part of the system of mid-ocean ridges that form as the tectonic plates of the Earth’s crust move apart—a process known as sea floor spreading. Among other things, the researchers on board Dayang Yihao located rich deposits of copper, lead and zinc, associated with hot springs called hydrothermal vents that are often found near mid-ocean ridges. And when the International Seabed Authority, which looks after such matters, promulgated regulations last May for the exploration of these sorts of deposits, China quickly made an application to do so in the Southwest Indian Ridge. The South China Sea, too, is thought to be a product of sea floor spreading—though the spreading in question happened between 32m and 16m years ago. And Lin Jian of the Woods Hole Oceanographic Institution, in Massachusetts, one of the leaders of the expedition to the Southwest Indian Ridge, is also running a sub-project intended to study the tectonic evolution of the area. This should help settle the questions of how the South China Sea came into existence, how much of its floor is basaltic ocean seabed, of the sort spewed out of mid-ocean ridges, and how much is continental rock that simply happens to be below sea level. The second part of the project, a study of sedimentation and the ancient climate, will follow up Dr Wang’s original examination of the area, in 1999, which was part of an international effort called the Ocean Drilling Programme. Despite all the disclaimers, this will be the bit of most interest to the oil and gas industry. Three large drainage systems, the Mekong, the Red River, and the network that debouches into the Pearl River delta, have carried about 14,000 trillion tonnes of sediment into the South China Sea over the past 30m years or so. That forms traps for oil and gas. It also preserves a huge amount of information about past temperatures, rainfall and sea levels. Jian Zhimin, also of Tongji University, and his colleagues hope to use this information to unravel the evolution of the modern climate—particularly of the Asian monsoon which, by providing enough rainfall for agriculture, keeps much of the continent’s population fed. They will investigate the modern climate directly, too, for the South China Sea’s eastern edge is part of an area called the Western Pacific Warm Pool. This has an average temperature of 29˚C, making it the hottest body of water in the ocean. It is thus an important source of climate-controlling heat and moisture, and is involved in regulating both the monsoon and El Niño, a weather-altering arm of warm water that reaches intermittently across the Pacific from South America. The third part of the project will look at the South China Sea’s biology—particularly at depth. This will be led by researchers including Jiao Nianzhi, of Xiamen University in Fujian province, and Tian Jiwei, of the Ocean University of China, in Qingdao, Shandong province. They will study the sequestration of carbon by micro-organisms, examine life around the springs and vents of the ocean floor, and make long-term measurements of currents and the exchange of nutrients and plankton between different parts of the South China Sea, and between it and the Pacific. All this costs money, of course. The budget for South China Sea-Deep is 150m yuan ($22m), to be paid for over the next eight years by the National Natural Science Foundation, a government agency based in Beijing. Nor is this China’s only oceanographic enterprise. 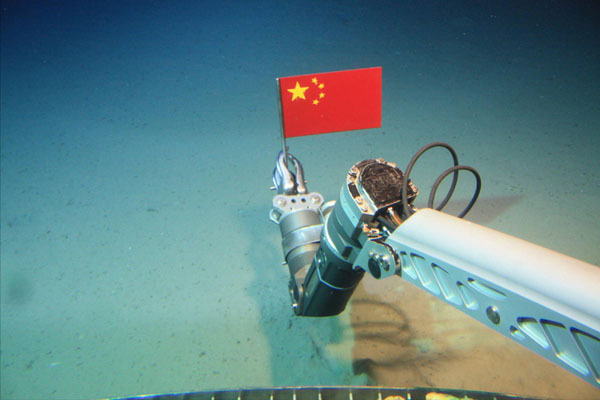 A deep-sea technology centre in Qingdao will cost 400m yuan and a network of sea floor observatories similar to Canada’s Neptune programme and America’s Ocean Observatories Initiative will clock up another 1.4 billion yuan. Money well spent, no doubt, in the interests of pure research. Still, it cannot hurt, as Zhang Gongcheng, of the China National Offshore Oil Corporation, observed in his talk at the meeting, that the reserve of natural gas in the South China Sea is estimated at 200 trillion cubic metres. Pure research is all very well. But buttering a few parsnips at the same time can do no harm. 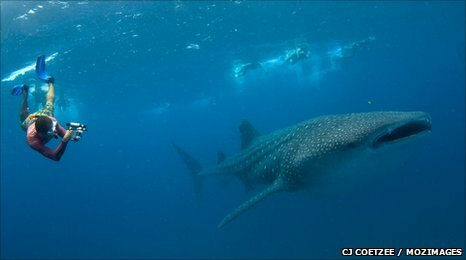 Whale sharks, the world's biggest fish, could be even bigger than previously recorded, a new study reveals. Scientists working in Mozambique have developed a new method of measurement using a camera mounted with lasers. Although previously estimated at up to 20 metres in length, accurate details of the giant fish have been difficult to obtain in the past. Researchers believe regular measurements will reveal more about the lifecycles of these sea giants. Scientists studying whale sharks (Rhincodon typus) describe a technological breakthrough in understanding the plankton-eating giants. Working with the University of Queensland, the Marine Megafauna Foundation and CSIRO Marine and Atmospheric Research, the team's findings are published in the Journal of Fish Biology. "Our paper is the first to publish accurate measurements for whale sharks in the field," says PhD candidate Christoph Rohner. "Other researchers have previously tried to measure the sharks with a tape measure, or by visually estimating size, which is obviously difficult to do accurately," he explains. Many previous size records were based on the photogrammetery method: estimating measurements from photographs. Researchers claim they have dramatically improved the precision of this method with the addition of two laser pointers. By positioning the lasers 50cm apart on either side of the camera, the distance between the projected points provides a fixed scale so that photographs can be analysed with greater accuracy. "The laser system will allow us to reliably obtain accurate measurements from free-swimming sharks, so we may well find out that the world's largest fish is even larger than presently recorded," says Mr Rohner. Researchers say their new method has already seen the recorded size of some individuals increase by up to 50cm. In addition to recording the length of whale sharks, researchers say the photographs could reveal more about the enigmatic species. "Whale sharks can be individually-identified using the distinctive pattern of spots on their flanks. 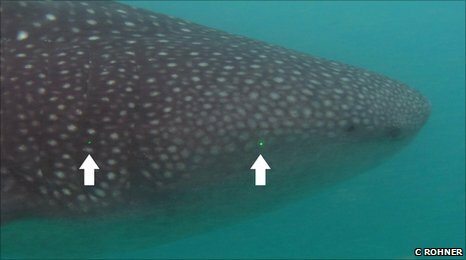 We project laser spots onto this region, allowing us to obtain both the identity and length of the shark with a single photograph," says Mr Rohner. "At present we have no clear idea about how long whale sharks live, but it may be for over one hundred years. By repeatedly measuring the same individuals over time, we hope to be able to eventually find out how old a twenty metre shark might be," he adds. Conservationists are concerned that the giant fish are under threat from commercial fishing including harpoon fisheries and incidental capture. Researchers claim that by understanding whale sharks' lifecycles, they can more accurately predict how populations are impacted by these activities. Mr Rohner emphasises the importance of measuring individuals over time to learn more about their development and confirm their growth rate. "Whale sharks are globally threatened, and this kind of basic but hard to get information is vital for effectively conserving the species," he says. Researchers estimate that 19% of the global population of whale sharks has been recorded off the coast of Mozambique. Recent satellite tagging experiments have shown the fish migrating extremely long distances of up to 13,000 km ( CSIRO). What will climate change do to the oceans? in the 21st Century from the 2011 NCSE conference in Washington, DC "Our Changing Oceans"
Via SkepticalScience (“Getting skeptical about global warming skepticism”), we were pointed to this excellent talk on the impact climate change will have on the oceans. John Bruno, one of the participants, posted the discussion by his friend and colleague Dr. Ove Hoegh-Guldberg from a session the two of them organized on climate change impacts on ocean ecosystems at the NCSE Our Changing Oceans meeting a few weeks ago in Washington, DC. Rapidly rising greenhouse gas concentrations are driving ocean systems toward conditions not seen for millions of years, with an associated risk of fundamental and irreversible ecological transformation. Changes in biological function in the ocean caused by anthropogenic climate change go far beyond death, extinctions and habitat loss: fundamental processes are being altered, community assemblages are being reorganized and ecological surprises are likely. and interactive instrumentation that lets you dive, dive, dive to the ocean floor. Google's latest interactive logo, to go live on Tuesday, celebrates Jules Verne's 183rd birthday, and it may induce seasickness. In honor of Verne's most famous novel, "20,000 Leagues Under the Sea," the logo has been transformed into the portholes of a submarine. A driving panel allows the viewer to take on the vaunted role of Captian Nemo and dive the submarine to the depths of the digital ocean, where shipwrecks and a giant squid dwell. The logo duplicates the swaying of the sea so accurately, wooziness may ensue. Ironically, the first "Twenty Thousand Leagues..." featured no illustrations. The tentacled adventures of Captain Nemo and the good ship Nautilus would receive appropriately eye-catching artwork, though, thanks to publisher-editor Pierre-Jules Hetzel. Verne, born on Feb. 8, 1828 in Nantes, was known for his provocative science-fiction novels. In a league of your own, indeed. The logo is already live in Australia, but should be up around the world by Tuesday morning. Vikings might have navigated foggy seas using crystals to analyze light from the sky, a trick similar to what honeybees do to stay on course on cloudy days, researchers suggest. Scientists are now planning experiments to see if they can replicate these practices. The Vikings dominated the North Atlantic from 900 to 1200 by skillfully navigating across the open sea. For instance, when the sun was out, archaeologists found the Vikings could have navigated with the aid of sundials — by tracking the sun's trajectory in the sky from east to west, they would've been able to locate north. But how did the Vikings navigate when the sun was obscured by fog or clouds that could last for days along key parts of their sailing routes? A controversial answer proposed by Danish archaeologist Thorkild Ramskou in 1967 was the use of mysterious crystals known in Viking sagas as sunstones. To understand how sunstones might have worked, one first can think of all light waves as either rippling up and down, left and right, or at any angle in between, a property known as polarization. Scientists conjectured that sunstones were naturally occurring crystals that served as polarizing filters — they blocked out all light except for that polarized in specific directions. Although it's unclear what sunstones might have been made of, researchers suggest they could have been composed of cordierite, tourmaline or calcite, all common stones in Scandinavia. The idea is that ancient mariners looked up through these sunstones on overcast days, when the entire sky looked equally bright. Light making its way through a cloudy sky is often polarized — if the way the crystal was angled matched the polarization of this light, the sky would look brighter, but if not, it would look darker. By rotating the sunstones to and fro, the sky would thus appear to periodically brighten and fade. Then, by looking for the patch of sky that was brightest regardless of the clouds, Vikings could have identified where the sun was and then have used the sundial to figure out which direction was north. For instance, in the Viking saga, "The Legend of Sigurd", it reads : "The weather was very cloudy, it was snowing. Holy Olaf, the king ... asked Sigurd to tell him where the sun was. After Sigurd complied, he grabbed a sunstone, looked at the sky and saw from where the light came, from which he guessed the position of the invisible sun." It turned out that Sigurd might have been right. Scientists have found that honeybees, ants and other insects can use polarized light to navigate under cloudy skies as well, potentially lending this idea some weight. However, these claims regarding Viking sunstones were never tested, and the concept has many supporters and skeptics, said biophysicist Gabor Horvath at Eotvos University in Hungary. To see if Vikings actually could use sunstones for navigation, Horvath and his colleagues measured the patterns of polarized light seen in clear, partly cloudy, totally overcast and foggy skies while in Tunisia, Finland, Hungary and the high Arctic. Their findings suggest the polarization of sunlight can in fact be detected through foggy and overcast skies. "We found that up to 5 to 10 percent of the incoming light near the horizon is polarized," researcher Susanne Åkesson, an animal navigation specialist at Lund University in Sweden, told LiveScience. "We now have demonstrated that the Vikings at least in theory could have used sunstones under overcast and foggy conditions to pinpoint the position of the sun." The researchers are now planning experiments with students using potential sunstone crystals to see if they can in fact determine the sun's location on overcast days, Åkesson said. The scientists detailed their findings online Jan. 31 in the journal Philosophical Transactions of the Royal Society B. It is located on the northern side of the island between mile markers 13 and 14 on the Hana highway and sits at the base of rolling sugar cane field hills. The surf break, a deep water reef break, is called "Jaws" due to the size and ferocity of the waves. The waves at "Jaws" can reach heights of 120 ft (36.6 m) on the face of the wave, moving as fast as 30 mph (48.3 km/h). The Jaws surf break is the home of tow-in surfing and has reached its worldwide watersports fame largely due to the frequent filming and photography of tow-in surfing legends performing there on enormous ocean waves breaking at the deep reef off the shore; famed big wave surfers such as tow-in surfing pioneers (also known as "The Strapped Crew"-for the rubber straps on their short surfboards to anchor their feet against the forces) notably Laird Hamilton and Dave Kalama. In order for the surf at "Jaws" to reach its extreme heights, many specific ocean and weather conditions must prevail concurrently. Because ocean swells large enough to produce this kind of surf occur only during winter months, primarily between December and February, they typically coincide with very strong winds which have a large effect on the surf. Other swells, particularly the small but powerful trade wind swells, can make the surf choppy and difficult to ride. There are several other surf spots around the world that boast similar wave heights; however, "Jaws" is famous for its wave forming quality. The reef and rocks at "Jaws" are shaped in a way that magnify incoming swell energy and produce clean and well defined right and left-directional waves with gigantic barreling (hollow, air-filled wave interior) sections. Mark Visser rides Jaws at night !